Here's some oddball Chapel Choir stuff that doesn't quite have a home elsewhere! 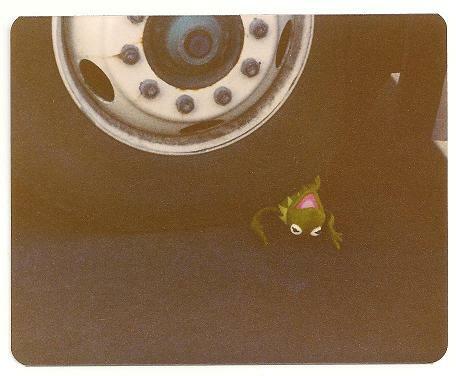 Yes, that's Kermit. Thrown under the bus! If you have not had the "fortune" of enjoying the Rainbow Connection, you can see and hear it here. 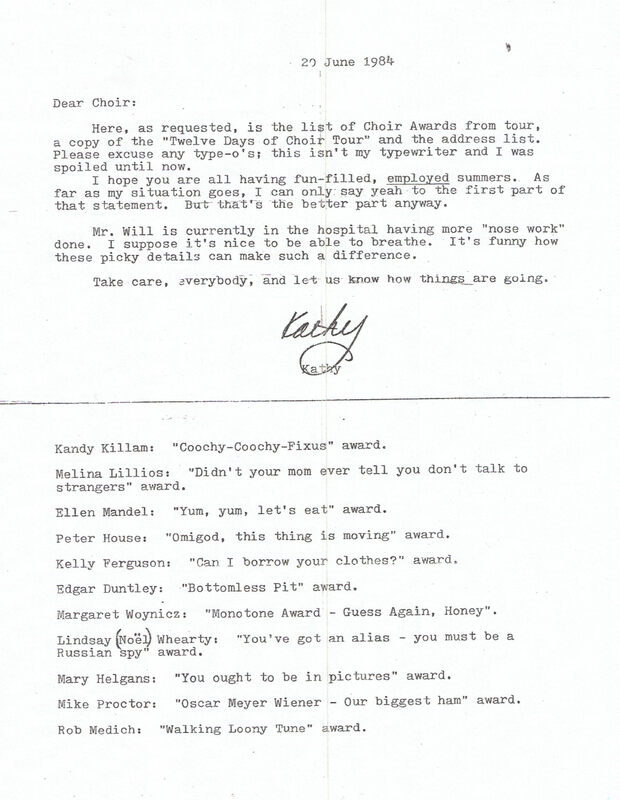 We now have the 1984 and 1985 Choir Tour awards, courtesy of Patty Yard (HCC 1982 - 1985)! Click here and here for 1984, and here for 1985. I was surfing around the internet, and found an old 1975 anti-war (Vietnam) newsletter from the Syracuse Peace Council. Just take a look at a couple of ads from the newsletter that may bring back some memories! 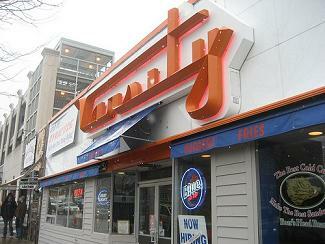 I don't know about you, but I drank a lot of 25-cent sangria and played a LOT of Missile Command at Hungry Charley's! The apparently long-defunct Abe's Donut Supreme supplied the goodies that managed to get many of us out of bed and to church on time on Sunday mornings! - Remember scarfing those down before we went out to sing on the chapel steps? This is the cassette tape that launched a website. As I'm sure you have read by now, the death of this little beauty sparked the panic that sent me on a mission to save our recorded music. Ironically, I found this cassette buried at the bottom of a desk drawer in my office at work - A drawer that was being cleaned out because my job had been eliminated. If I hadn't lost my job, this cassette would never have been found. And this site would never have been born. Prior to the 1979 Western tour and again before the 1984 Gulf Coast swing, the choir raised money by breaking up into quartets and delivering madrigal-style "Birthday grams" around campus. I have found a snippet of the song they sang, and Will Headlee explains how it was done in this 1984 performance in Bradenton, Florida. Enjoy! 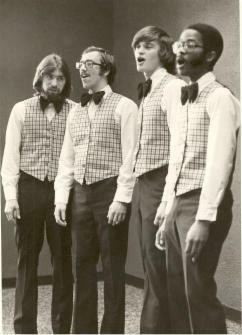 This is the original HCC Men's quartet, "The Augmented Four" circa Spring 1976, when the choir toured in Europe... From left to right - John Martin, Dan Peterson, Wayne Williams and Keith Gatling! Many thanks to Tracy Kaplan Leenman (HCC 1975-1977) for the photo. Tracy helped arrange music and sometimes provided piano accompaniment for the original "Augmented Four"... She recalls, "Being a 'chapel' choir never stopped those guys from pushing the envelope with their innuendos!" Click here to read a letter from Rep. George Wortley (R.-NY), inviting DC area Syracuse University alumni to see the Hendricks Chapel Choir perform on the East steps of the United States Capitol in March, 1982. You will note that the letter is dated four days before the concert, which probably explains why Congressman Wortley was the ONLY person to see us perform! 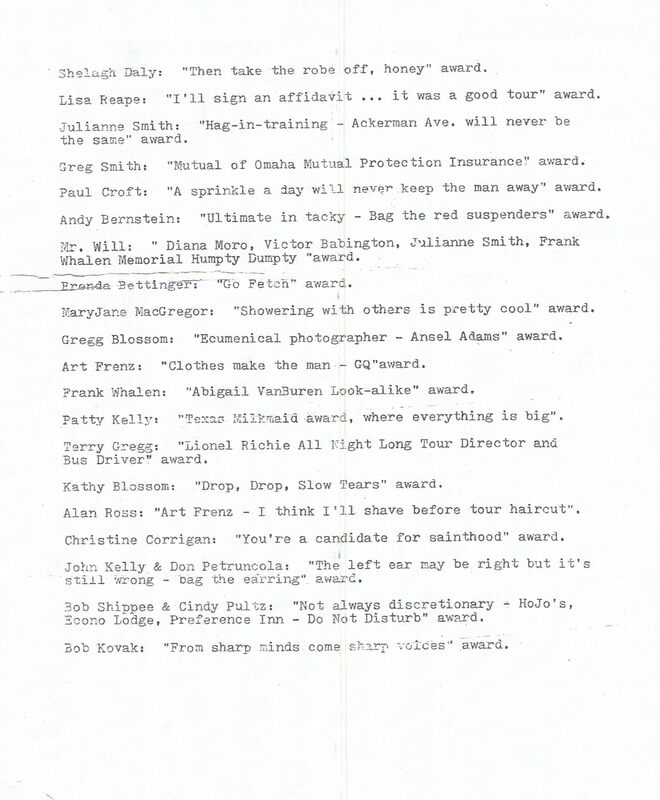 From my choir folder - The 1982 Spring Tour choir awards - See the complete list transcribed here! We often wrote parody songs to "honor" each year's tour. Here's one from 1981. 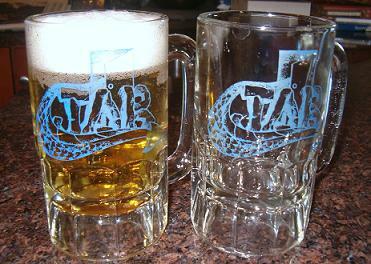 And a much better one from 1982! Here's one more parody song from 1982. It's a bit cringe-inducing now for those of us with teens looking ahead to college, but what the hell! 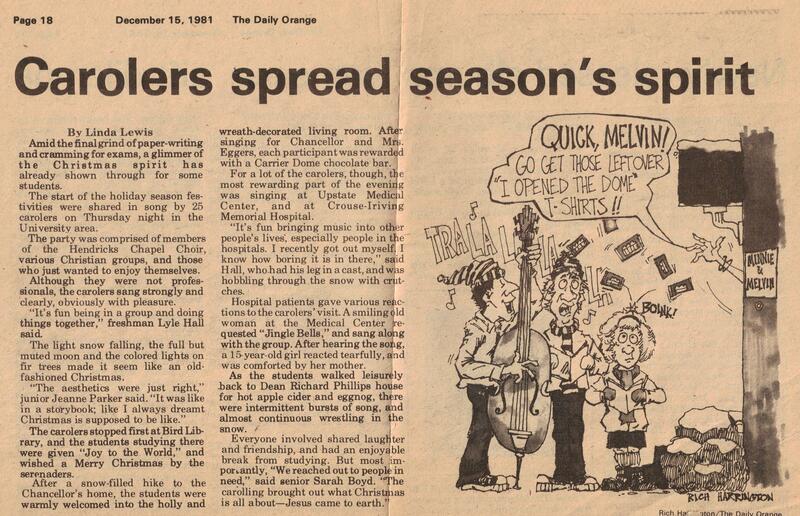 At Christmas time 1981, several members of choir went caroling at Chancellor Mel Eggers' house! In the spring of 1982, S.U. 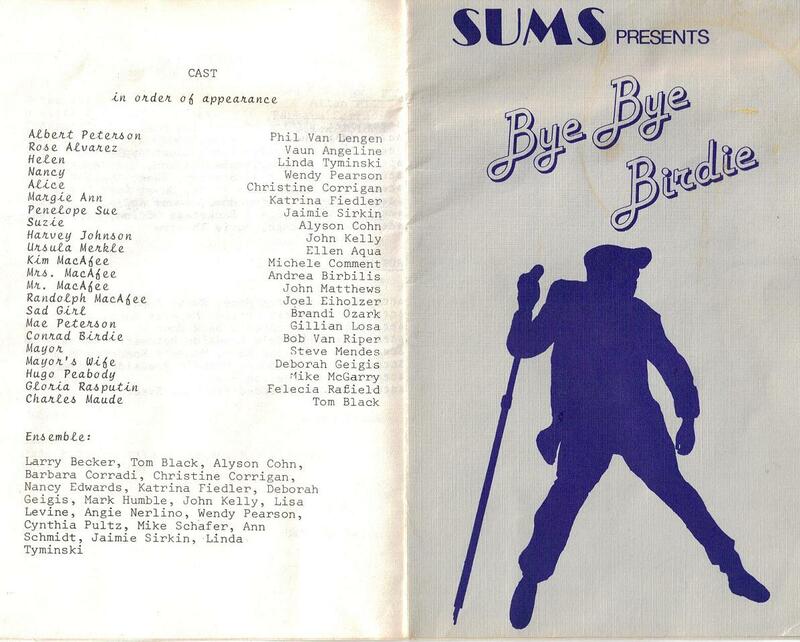 Musical Stage put on a production of Bye Bye Birdie, directed by the HCC's own Allan Hill. How many other choir members can you spot in the cast and ensemble? Don and Mary Petruncola sent along this picture as a reminder of oldies night at the Jab! Remember the Jab? In the basement of Kimmel Dining Hall, right across the street from Watson Theater! It closed in 1985. If anyone else cares to share, send it to me!